What is Magento Custom Option? The custom option is ideal when the inventory needs are simple because it the newly created custom options are based on variations of one SKU. The variety of customization when adding new option is the greatest strength of custom option, even though it still has certain limitations. 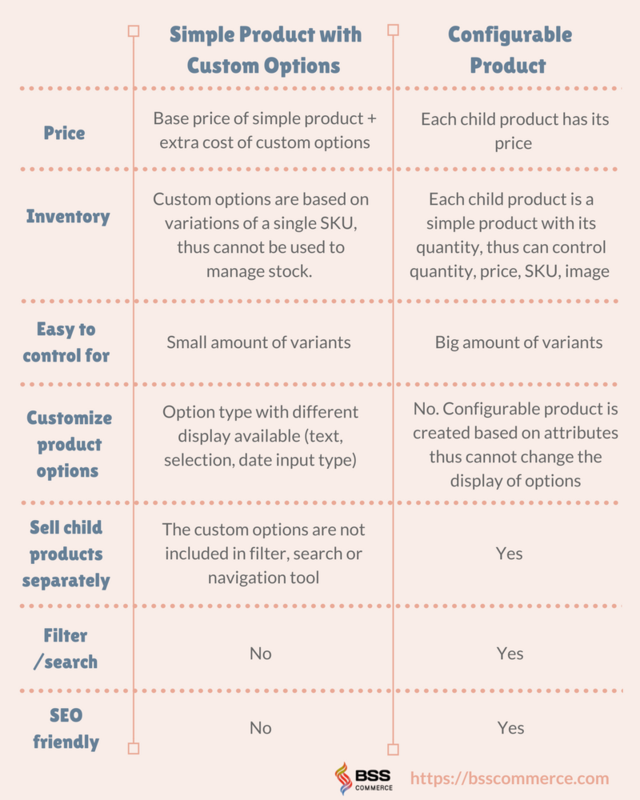 Continue reading to see the pros and cons of using custom option for a simple product in comparison with a configurable product. Both simple product with custom options and configurable product offer admin solutions to create product variations but they have different approaches. While configurable product creates an associated product based on the attribute (for example color, size…), simple product with custom options creates variations by adding customizable options to a product. Using custom options for a product has its strengths and weaknesses. Depending on your purpose, you can choose a suitable method to create a product. The simple product with custom options is ideal when you want to offer customization service for the customer, for example selling a T-shirt that customer can print any text on. However, if you want to sell a T-shirt with different colors and sizes, the configurable product is a better solution. Despite the pros of adding the different custom option to the product, Magento does not support uploading images for each option. Custom Option Image can solve that limitation and significantly improve product visual.